Several properties along the Dale Road had large double wooden doorways with the curved tops that served as coach houses in former times including those nearest the camera belonging to the Boat House Hotel, the building on the far right with the name Hardy's on it. The property had an outside staircase on the side away from the camera and the 4th Matlock Scout Troop used the upper floor for their weekly meetings. The building was eventually demolished and the land it stood on is now a car park. Various early twentieth century advertisements announced that the Boat House provided good stabling and a garage. Unfortunately, in August 1906 there was a fracas at the stables, which were then used by the cab proprietor Horace George Donegani of Matlock Bath. Two labourers from the Derwent Valley Waterworks Scheme, who had been drinking at the hotel, went to the stables and asked if they could spend the night there. Mr. Donegani's groom, whose surname was Norbury, refused the request. Mr. Donegani was also present and at some point was slightly wounded on the hand by a knife which one of the inebriated men had drawn from his pocket (and later hidden in his coat). Although the two drunks went on their way, Mr. Donegani followed them on his bicycle; when he came to the police they were arrested and taken into custody. The two men at least had somewhere to spend the night, even if it wasn't quite what they envisaged. Both were prosecuted, one of them for an unprovoked assault an the other for being drunk. P.C. Laidlaw commented that he had never heard such foul language.. Earlier the same year Matlock's second annual May Day Parade had taken place and was deemed a success. There were several cab proprietors involved, including F[rank] Donegani of Matlock Bath, the brother of Horace, and it was agreed that they had put on a good display and various competitions. These included a class for carriage proprietors (one horse and carriage) and both Frank and Horace, the latter of the Boat House Livery Stables, took part. The departure of Horace Donegani left a gap and here were several applications for his bus business between Matlock and Cromford. 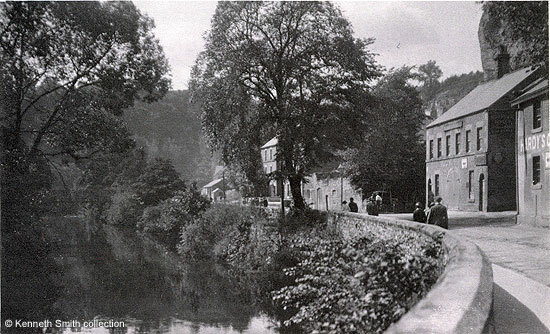 "River Derwent & Dale Road, Matlock", published by Lilywhite of Sowerby Bridge, West Yorkshire and is numbered MAT. 11. Difficult to date, but likely to be early 1930's. Postcard in the collection of, provided by and © Ken Smith. The stable block was included on both the 1:2,500 Ordnance Survey map for 1967 and the 10:5,600 map of 1971-2 but not on later versions. "Derbyshire Advertiser and Journal", 17 August 1906. Serious Assault at Matlock. "Derbyshire Times", 5 May 1906. Matlock on May Day. Another Successful Parade. "Derbyshire Courier", 20 July 1907.